Fully seam-sealed. Lightweight and packable into left pocket. Contrast front zipper. Waterproof to 3,000mm. Breathability of 3,000gm/m2/24hrs. Size Chest (to fit) M - 40/42" L - 42/44" XL - 44/46" 2XL - 46/48"
Unisex styling. Laptop compatible up to 15.6". Padded laptop compartment. Media pocket and headphone port. Fully lined. Zippered main compartment. Zippered front pocket. Side pocket. Padded back and base panels. Padded adjustable shoulder straps. Grab handle. Dimensions 30 x 44 x 21cm Capacity 15 Litres Embroidery 18 Tubular hoop PrintArea 19 x 19cm Washing Instructions Sponge clean only. 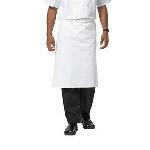 Refined chef's jacket. Hand rolled cloth buttons. Double breasted. Soft hand feel. Refined stitching. Tapered placket. Short sleeved. Mandarin collar stand with top stitching. Powered by X-Cart shopping cart software| Maintained by Winklab.